Polymer is a library of polyfills and sugar which enable the use of Web Components in modern browsers. The project allows developers to build apps using the platform of tomorrow and inform the W3C of places where in-flight specifications can be further improved. generator-polymer provides Polymer scaffolding using Yeoman (a scaffolding tool for the web), letting you easily create and customize Polymer (custom) elements via the command-line and import them using HTML Imports. This saves you time writing boilerplate code so you can start writing up the logic to your components straight away. In addition, this generator leverages polymer-starter-kit-plus to provide ES2015 support "out of the box" along with many other bonus features! See this README for more details. This generator clones Polymer Starter Kit and seed-element. If you're having issues with the template files generated for those projects, please raise them on those repos as they are the canonical source. 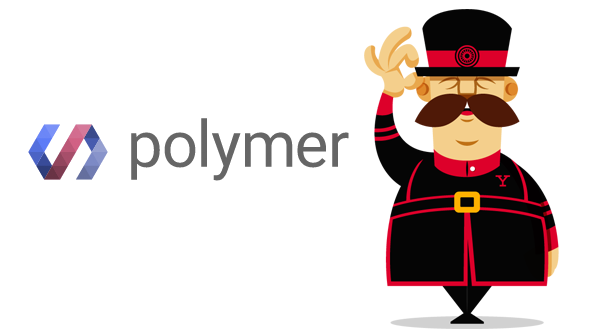 Sets up a new Polymer app, generating all the boilerplate you need to get started. Generates a polymer element in app/elements and optionally appends an import to app/elements/elements.html. Note: You must pass in an element name, and the name must contain a dash "-"
Generates a reusable polymer element based on the seed-element workflow. This should only be used if you're creating a standalone element repo that you intend to share with others via bower. If you're just building a Polymer app, stick to the Element generator. To preview your new element you'll want to use the polyserve tool. Generates a Github pages branch for your seed-element. This requires that you have SSH keys setup on GitHub. If your documentation or demo pages have dependencies declared as devDependencies in bower.json, they will be included in your GitHub pages branch. If, for some reason, you don't want the devDependencies, use the --nodevdeps option. See the web-component-tester readme for configuration options. The app generator will produce an elements.html file where you can place your imports. This file will be vulcanized when you run the default gulp task. You'll want to make sure that elements.html is the only import in your index.html file, otherwise there's a good chance you'll accidentally load Polymer twice and break the app. When submitting an issue, please follow the guidelines. Especially important is to make sure Yeoman is up-to-date, and providing the command or commands that cause the issue.